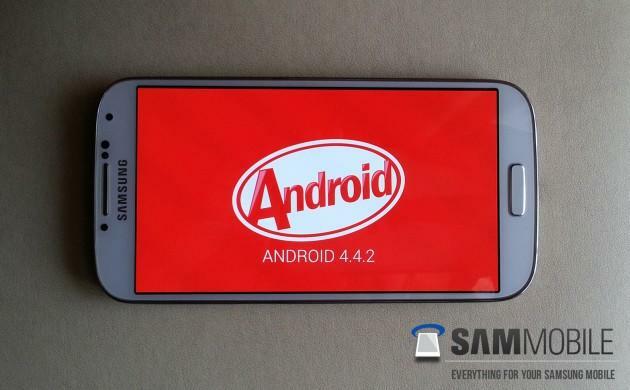 Samsung isn’t expected to upgrade the Galaxy S4 to Android 4.4 KitKat until next month at the earliest, but if you can’t wait that long, a newly leaked test build will let you make the jump to Android 4.4.2 today. The firmware comes to us courtesy of SamMobile, which also offers up a detailed set of instructions on how to manually update your smartphone. Unlike previous test builds, this one appears to be stable according to SamMobile, and apparently won’t turn your smartphone into a buggy mess. The update comes with a slight makeover for Samsung’s custom UI, most noticeably changing status bar icons from green to white, as well as new a transparent status bar and an improved keyboard for landscape orientation. For the most part, however, it still looks like standard TouchWiz. Under the hood, however, your Galaxy S4 should see some noticeable improvements. Thanks to Android 4.4’s focus on using up less memory, your device will likely run faster and perform better than it did with Jelly Bean. SamMobile says a benchmark test confirmed a slight bump in speed, too. Overall it doesn’t sound like upgrading to KitKat will revolutionize your Galaxy S4, but if you can’t wait head to the source link below for instructions. Of course, there’s danger with this type of unofficial upgrade so proceed and your own risk, and make sure to backup your phone first before you do.